Morrison F. Warren, a Professor Emeritus of Education at Arizona State University, dedicated his career to improving the lives of Arizonans. Dr. Warren was born on December 6, 1923 in Marlin, Texas, but his family moved to Phoenix in 1925. After graduating from Phoenix Union Colored High School, he attended Phoenix College and married before being drafted into the U.S. Army in World War II. A significant turning point in Dr. Warren’s life came on the day he drove an officer to Buchenwald Concentration Camp and viewed the thousands of Holocaust victims. He realized man’s inhumanity to man was much broader than the black and white racial issues in the United States. He dedicated himself to becoming a bridge-builder between people and issues. After the war, he returned to Arizona and entered Arizona State College, now ASU, to begin his life’s mission by earning a degree in elementary education. He believed he could have the greatest impact on the lives of people by intervening in the problems of cultural relations and barriers at an early age. While at Arizona State College, Dr. Warren played on the football team. Following graduation, he briefly played professional football. Dr. Warren began his teaching career in the Phoenix Elementary School District where he taught at Dunbar. He was soon named principal of Booker T. Washington. 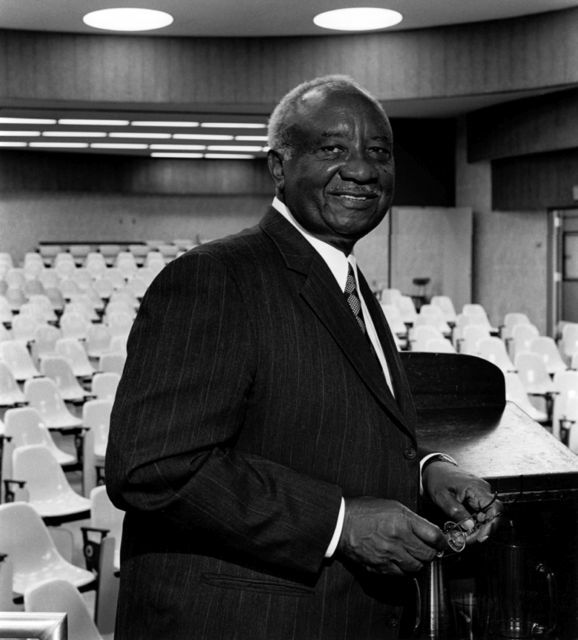 He earned a master’s degree in 1951, and a doctorate degree in 1959, both from ASU, in educational administration and supervision. In 1968, he took the position of associate professor in the College of Education at ASU and was promoted to full professor in 1974. At the beginning of the 1973 school year, a racial crisis developed at South Mountain High School and Dr. Warren was called upon to resolve the situation. For the 1973-74 academic year, he accepted the challenge of concurrently serving as professor at ASU and principal at South Mountain High School. During his tenure at ASU, he was the first and only director of the I.D. Payne Laboratory of Education, a research arm for the College of Education, devoted to maintaining and developing relationships with the public schools. Dr. Warren contributed to the Valley community by serving as a member of the Phoenix City Council beginning in 1965 and as vice-mayor in 1969. He was a member of the Arizona Advisory Committee to the U.S. Commission on Civil Rights and served as chairman for ten years. He was also involved with the Head Start program from its inception in Arizona in 1964. Dr. Warren was a member of numerous Valley boards and committees. He was proud to have been president of the 1981-82 Fiesta Bowl, the year the bowl game took on the challenge of playing on New Year’s Day. Dr. Morrison Warren garnered a host of awards, including the Brotherhood Award and the James Creasman Award. The Valley Leadership Visionary Award that Dr. Warren received captured the essence of his lifelong commitment to improve the lives of people in the Valley and the rest of Arizona.